Aubryana Ramirez is your average 10-year-old: Energetic and ornery (her nickname is Sweet and Sour), she adores sports, swimming and making slime. But instead of a summer spent with friends and family by the pool, she spent most of it in a hospital room. Aubry started complaining of lower back pain in May. She was prescribed pain medication, but when she woke in the night screaming out in pain, her parents, Amy and Roy Ramirez, knew something more serious had to be wrong. 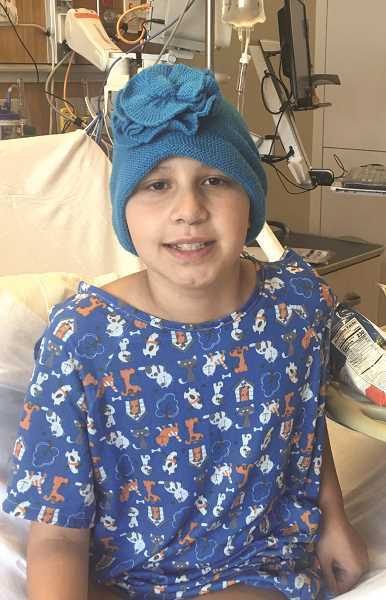 Doctors found a golf ball-sized tumor near Aubry's pancreas, liver and intestines that turned out to be stage 3 non-Hodgkin's B cell lymphoma. "The doctors think my tumor started growing on my birthday, May 9," Aubry said. Amy Ramirez said the surgeon who took the biopsy said cancer was actually the best option they could hope for because the tumor had three major arteries going through it. That meant surgery would be nearly impossible, but heavy chemotherapy treatments could easily shrink it. "It seemed so backward: Who thinks to pray for cancer?" Amy Ramirez said. "But it actually was a relief because I wouldn't know what the plan would have been from there." The situation sounded all too familiar: Not only did Amy herself have a cancer scare when she was 12 years old (it ended up being benign), but her father, Jerry Blem, just went into remission from non-Hodgkin's B cell lymphoma this spring. "That's how we told her, that she has the same cancer as her Papa," Amy said. 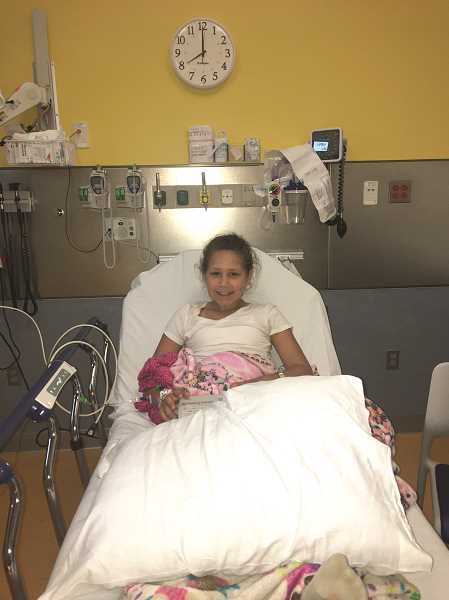 After a week and a half of intense chemo treatment at Randall Children's Hospital in Portland, where Aubry checked in July 15, a CT scan revealed the tumor has already shrunk by 60 percent. "It had to be very intense because it's fast-growing," Amy explained. "She lost 25 pounds and was as sick as a dog." Following the first three weeks of intense treatment, the original plan was to have a week of chemo followed by two weeks at home. "We had to push that back because her immune system got knocked down," Amy said. "Five hours after we got home she got a fever and we had to rush her back to the hospital." The chemo treatments haven't been easy. "(The hardest part is) taking pills because I don't like them because they make me throw up," Aubry said. Coming home has its difficulties too. Aubry has to basically be quarantined if her siblings Austin, 14, and Aly, 12, bring friends over. And Aubry, determined to get some family time in, wore a mask and her IV at a poolside gathering recently, even though she couldn't join her cousins in the water. And of course, even though she can come home, she can't go to school. With her treatments, that means she's looking at January as the earliest she can join her fifth-grade class at Lincoln Elementary. "I don't want to miss school because people will think I'm a new student," she said, adding that she also wasn't keen on losing her hair. "It made me sad," Amy said, "because what little girl wants to shave her hair. But it would just fall out in clumps. ... I've always had hair down to my waist and I cut it to my chin. When she saw it she said, 'Oh, Mom, now you can't wear braids.' And I said, 'It's only hair, it'll grow back.'" Also helping to soften the blow was that Aubry's aunt Kathleen shaved her head alongside Aubry — and though not alongside her when they did it, her grandpa "Abuelo Nacho" and uncle Jose also shaved their heads. That act is one of dozens of kindnesses bestowed on the family in the past few weeks, with people coming over to take care of the yard, bringing groceries or just reaching out with well wishes via text. The rallying cry of family and friends has been "Aubry Strong" which originated from Amy's sister-in-law in a group text. "No one had even said it out loud, and then all of a sudden I was seeing it on Facebook," Amy said. Beyond paying medical bills, which are mostly provided for through insurance, the Ramirezes had looked at taking out a second mortgage to pay for other finances that have accrued due to them taking time off from work to be with Aubry. While Roy is gradually returning to work at a Safeway distribution center, which has been very accommodating, Amy will take the fall off from her job as a teacher at French Prairie Middle School. "It was so great when work says don't worry, your job is here when you're ready to come back," Amy said. Amy's best friend since kindergarten, Kristi Stoltenberg, started a GoFundMe page — www.gofundme.com/aubry-strong — to help the family with basic day-to-day finances. "I have kids and if anything were to happen to us, I don't know what I would do," Stoltenberg said. "They've done so much for others that I wanted to be able to take that load off." As of Monday afternoon, the GoFundMe page had raised $7,930 of a $15,000 target. "We're so thankful for all the support," Amy said. "How great people are in a small town." She added, "We feel so blessed there's a light at the end of the tunnel." Aubry can't wait until the end of that tunnel, too. "(I look forward) to maybe go on a big vacation on an airplane, go swimming, play basketball, and to be with my family and friends whenever I want to, not just when my blood counts are good," she said. "And having my hair back." While she's now well-versed in many new medical terms, there's something else that Aubry said she's learned from this process: "Lots and lots of people love me and I didn't know that this many people love me."